Origin of the name "Whyalla"
In 1914 the town of Whyalla was proclaimed in the SA Parliament. The origin of the name is open to debate, but it is believed to have been named after a nearby ridge, Mount Whyalla. However, it could also have evolved from a similar word in the Barngarla language - 'Kayalla' which means 'Northern Country'. Manning's Place Names of SA, 1990 edition by Geoffrey H. Manning refers: Whyalla - Before the town was proclaimed on 16 April, 1914, a hill about 15 kms from the town was called "Whyalla Hill". Prof N. B. Tindale disagrees with the suggestion that it means "place of water". He said an Aboriginal tribe near Port Pirie had a work wajala meaning "west" while a tribe near Port Augusta had a word waila meaning "I don't know". 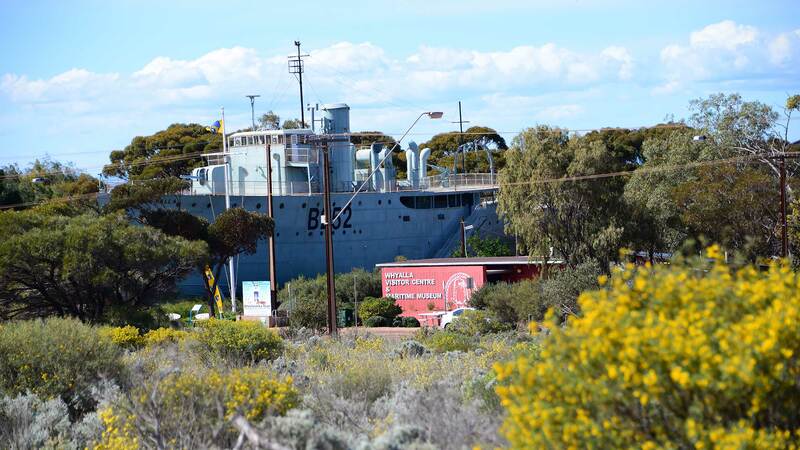 The Whyalla Maritime Museum is home of the former HMAS Whyalla, the first ship built in the Whyalla Shipyards in 1941. It stands high and dry, 2km from the sea and 2 metres off the ground. Thousands of visitors every year enjoy the unique experience of actually walking under the ship before boarding with their tour guide. The Maritime Museum building houses a treasured collection of artefacts and memorabilia. The World War II Gallery documents the story of the four wartime corvettes built in Whyalla – HMAS Whyalla, HMAS Pirie, HMAS Kalgoorlie & HMAS Gawler. The BHP Shipbuilding Gallery reflects Whyalla’s shipbuilding era - the shipyards were open from 1940-1978 and in that time sixty six vessels were built, including warships, carriers, tankers, ferries, container ships, barges and an oil rig. The Natural History gallery features the Gulf’s diverse marine environment - the 1814 edition of Matthew Flinders’ journals and charts are on display, reflecting the early maritime heritage of the first European exploration of the upper Spencer Gulf. The Singing to the Sharks exhibition explains the story of the indigenous people of Whyalla and their unique rituals connected to the sea. Discover one of the largest H0 gauge model railways in Australia with over 400 metres of track. The model landscape features railway lines between OneSteel in Whyalla and the iron ore mines in Iron Knob, a link between Whyalla to Port Augusta, and Port Augusta to Adelaide. The trains include iron ore trains, cargo trains, grain trains, The Indian Pacific and The Ghan. The landscape reflects both the semi-arid conditions around Whyalla and green fields with rolling hills at South Australia’s grain belt in the mid-north centred around Snowtown. The model railway was constructed by members of the Whyalla Model Railway Society who continue to upgrade the track and ensure it is maintained and running smoothly for all to enjoy. The museum complex is surrounded by a large tranquil Australian native plants garden with electric BBQ’s, a boardwalk to the Museum’s pond, and plenty of shady lawns. On display in the Museum grounds are a 19th century heritage anchor and a shipyards crane hook constructed in 1943. Location: Whyalla Visitor Information Centre, Lincoln Highway, Northern entrance to the city. The museum is operated by the Whyalla branch of the National Trust and is in the centre of the city. The heritage listed lighthouse and two lighthouse keepers’ cottages are the oldest buildings in the Whyalla area. Completed in 1883, the lighthouse eased the way for maritime traffic around Point Lowly.